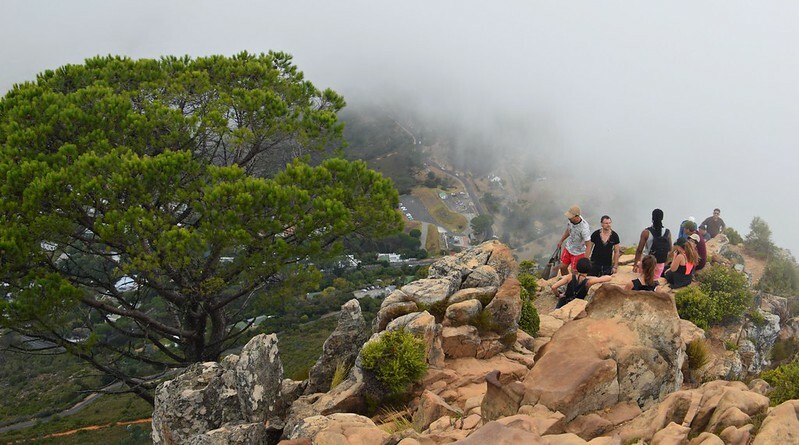 Table Mountain is a flat-topped mountain, and an iconic landmark in Cape Town. 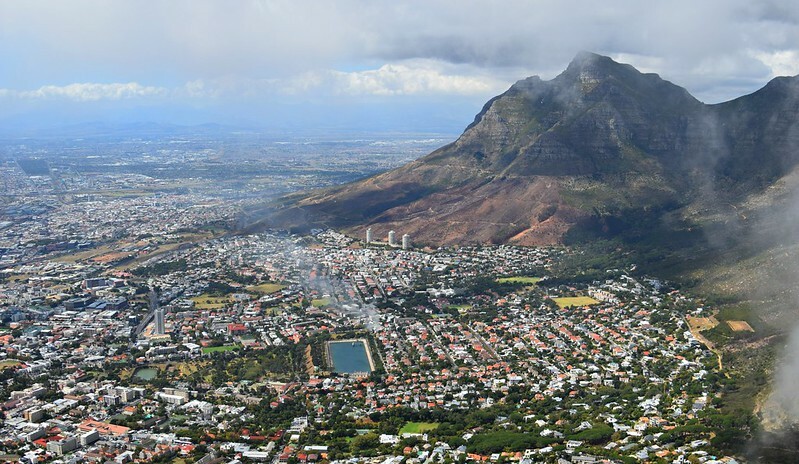 What you might not know; however, is that there are actually three major mountains towering over Cape Town: Devil’s Peak, Table Mountain, and Lion’s Head. 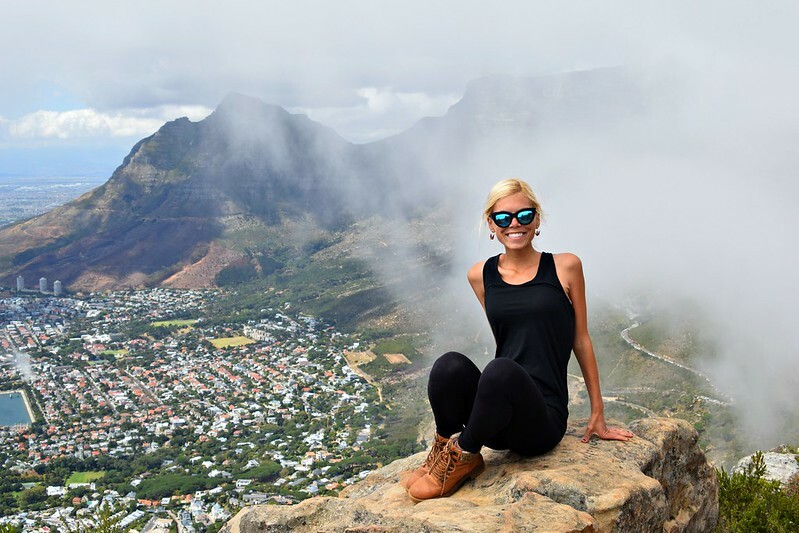 Now, while climbing any of the mountains offers an incredible chance to hike in nature, with rewarding panoramic views at the top, my favorite hike in the city would be to the top of Lion’s Head, because from that vantage point, I could not only see the beautiful city of Cape Town, but also views of the famed Table Mountain. 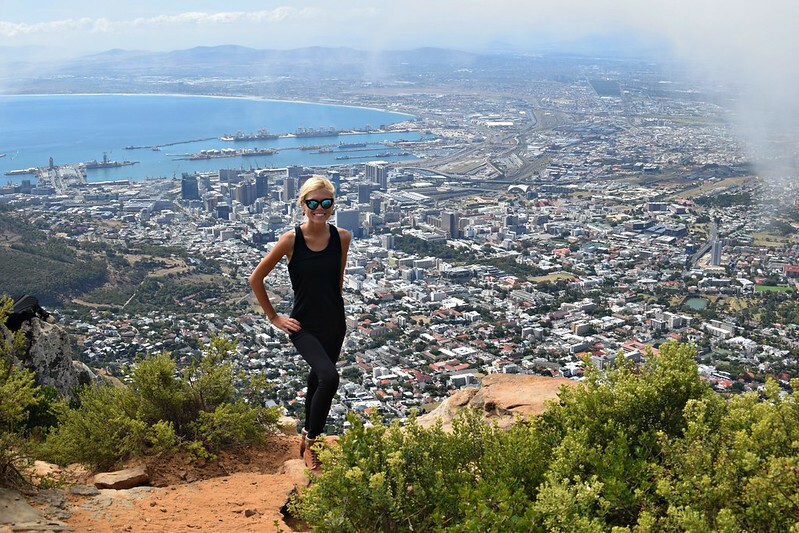 To get to the top of Lion’s Head, I made the 1.5 hour rocky hike to the top. 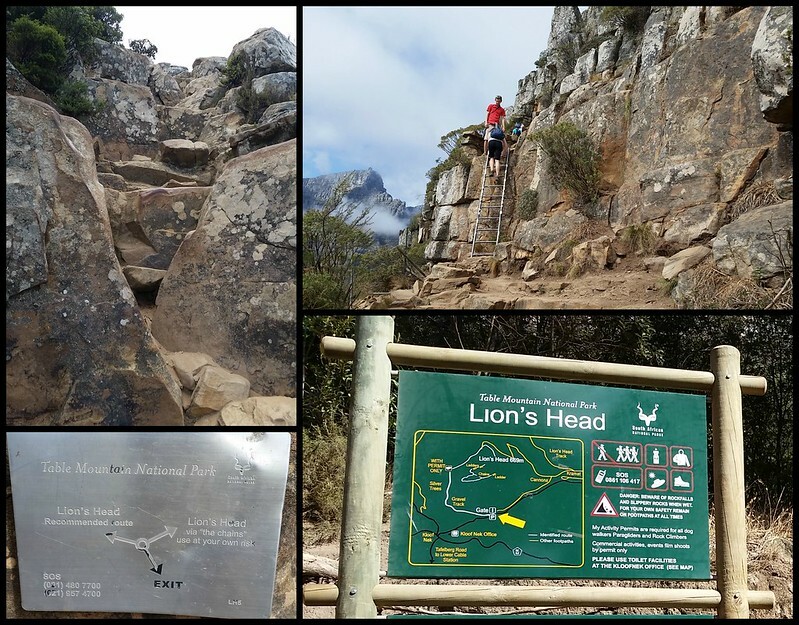 Fun fact: Lion’s Head is literally named after a pride of lions that used to live upon this rock! 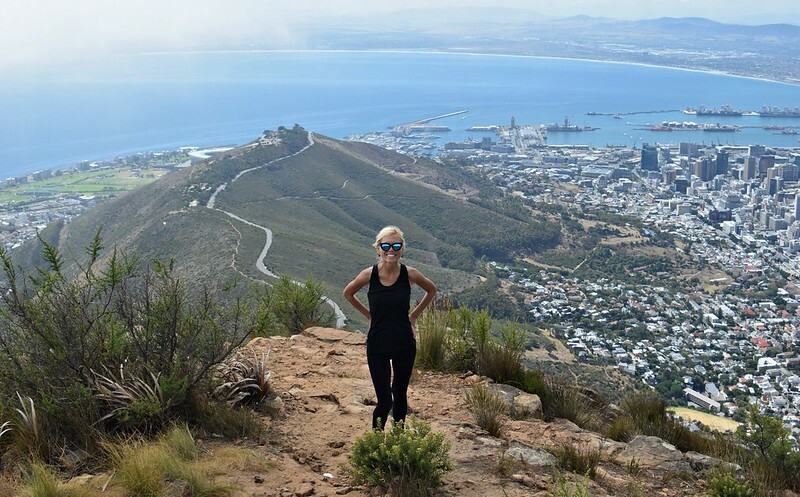 😀 The distance to the top is about 5 km, with an increase in elevation of 500 meters. 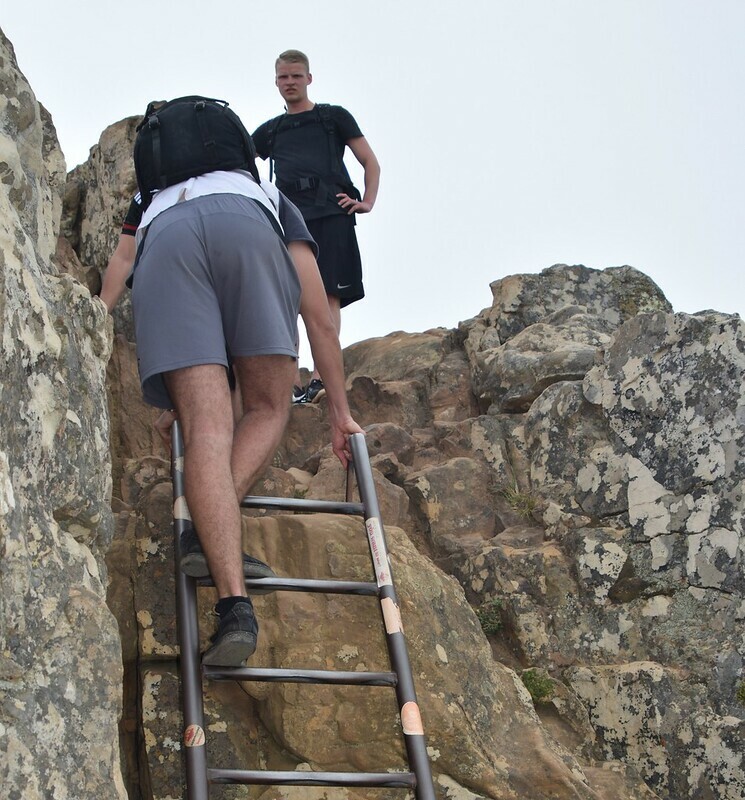 The initial path was relatively flat, but at some points, the climb was almost vertical. 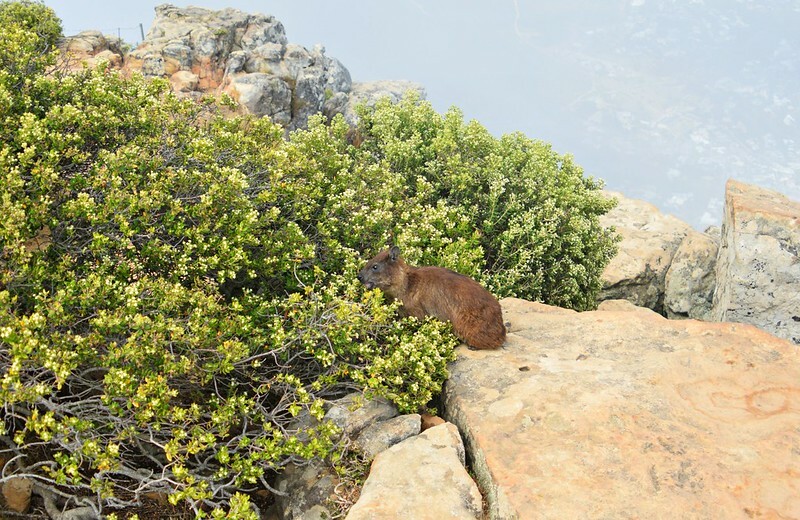 😮 Fun fact: Lion’s Head is incredibly biodiverse, with an array of wildlife, including rock hyrax, and species of local vegetation endemic to this mountainside. Fun Fact: Low-hanging clouds are also common as you approach each mountain’s peak. 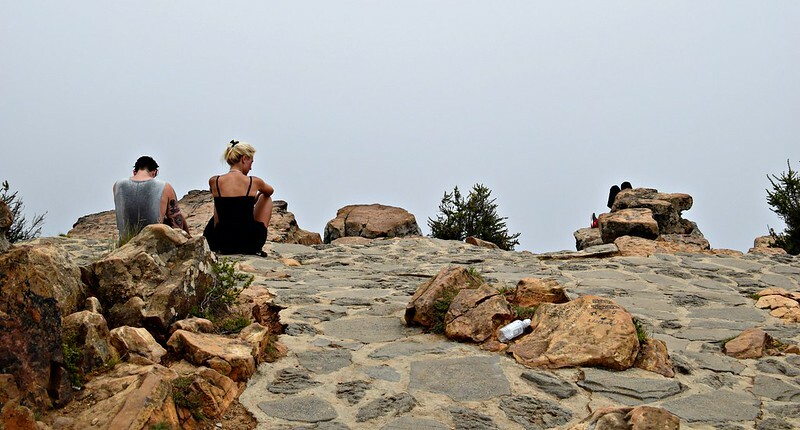 This might obstruct your coastal views and makes for an almost eerie vibe, but also cools down the temps, which makes the hike bearable. 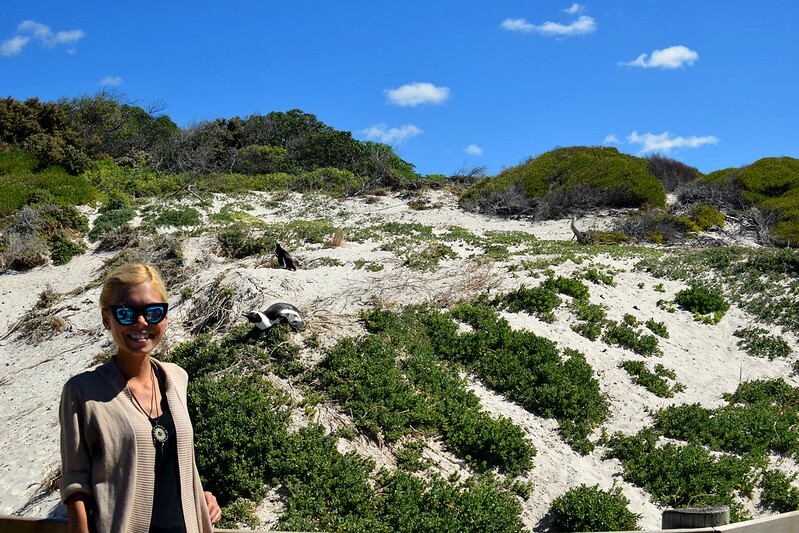 Now, aside from my hike to the peak of Lion’s Head, another rewarding day trip I took away from the city center of Cape Town was to visit the African Penguins at Boulders Beach. 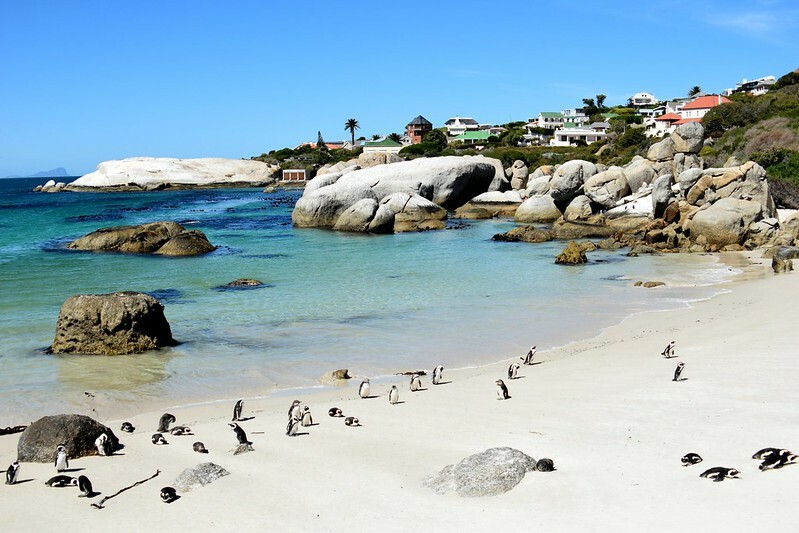 Boulders Beach is located in Simon’s Town. 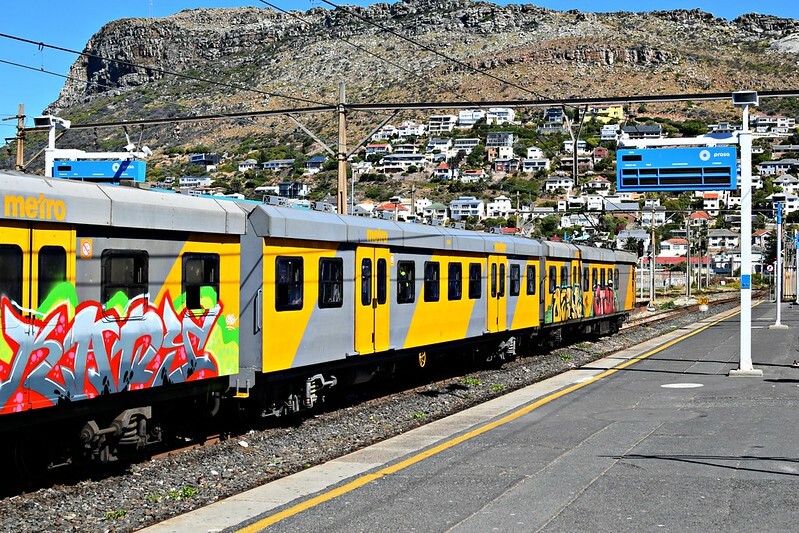 To get there from the Cape Town, I took a train, which cost less than 1 USD, and took about 1.5 hours. On the way there, I chatted with some local South African college students from Johannesburg. 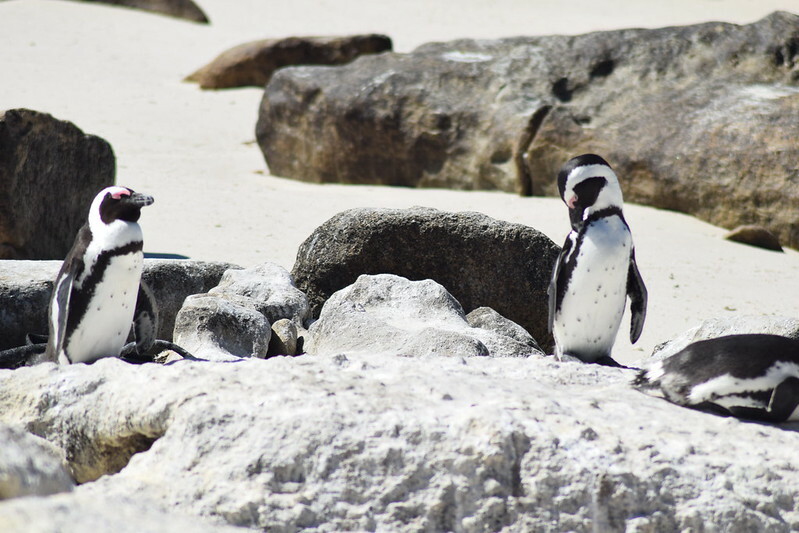 They were visiting their sister in Simon’s Town, and offered to give me a ride in their Volkswagen to the visit the penguins. 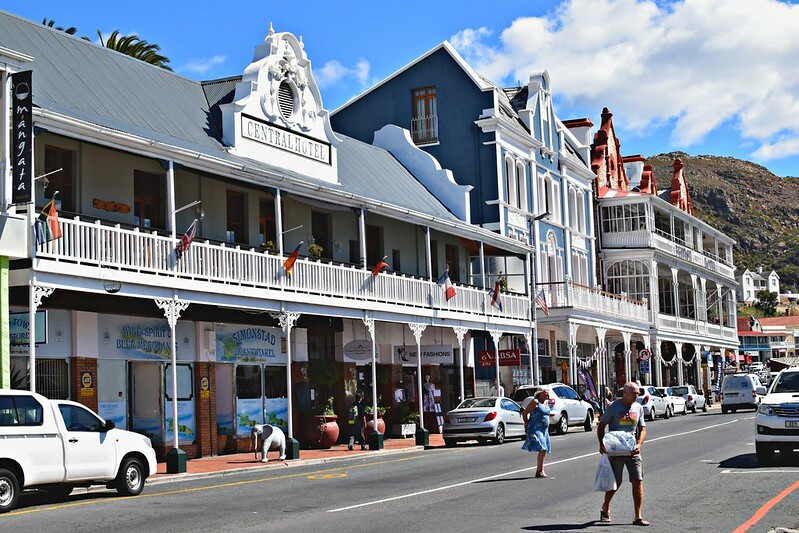 During the drive, they talked to me about the town, which is an old naval base, and which also surprised me for its charm and character. 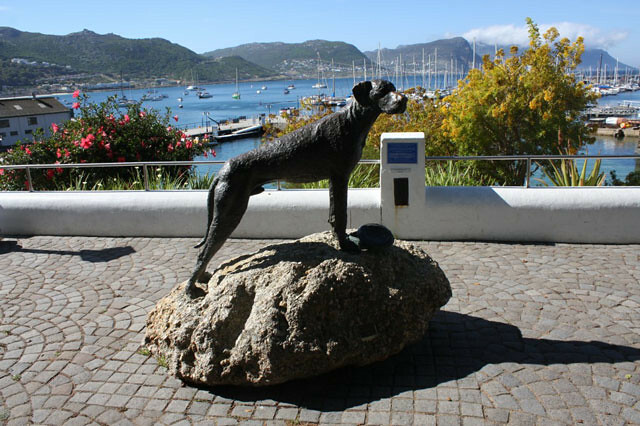 They also told me about a legendary Great Dane in Simon’s Town, who used to follow around the sailors, and spent his days laying on the decks of their boats. He was so beloved, he was made an honorary member of the forces, and became the only dog to be officially enlisted in the Royal Navy. 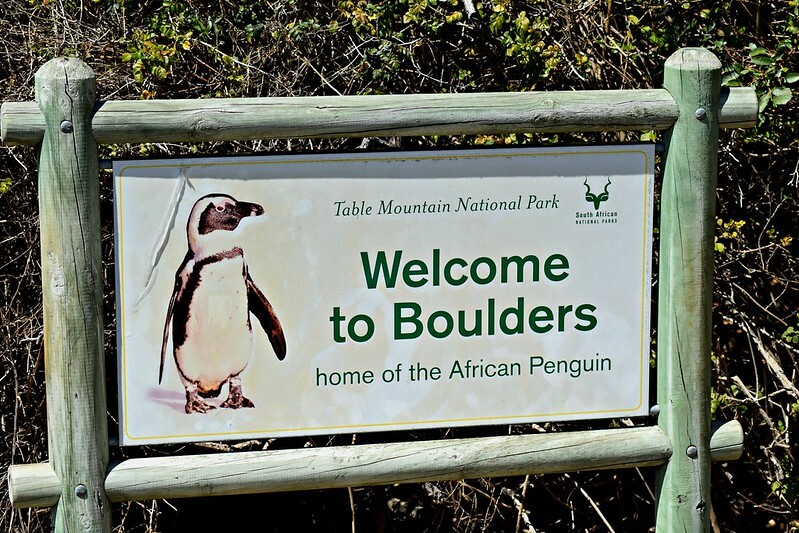 Anyway, after a 5-minute ride, they dropped me off the main attraction, Boulders Beach. 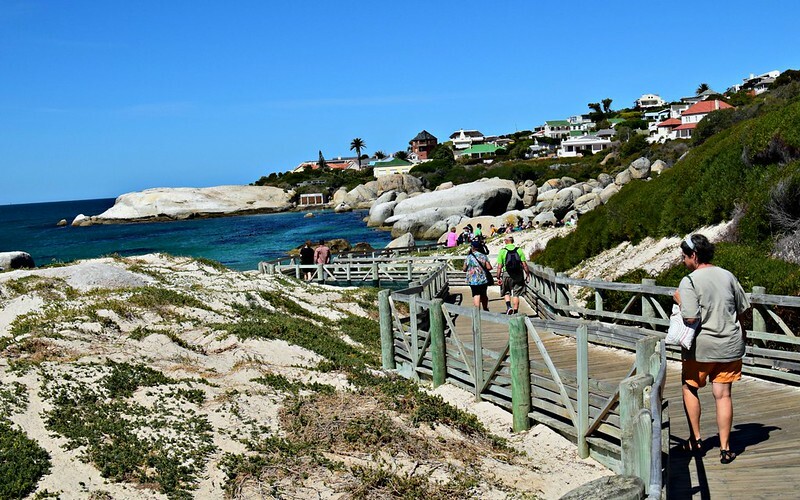 🐧🐧🐧 The cost to enter was 5 USD, which is used to maintain the facilities, which includes a gorgeous wooden boardwalk to the coast. 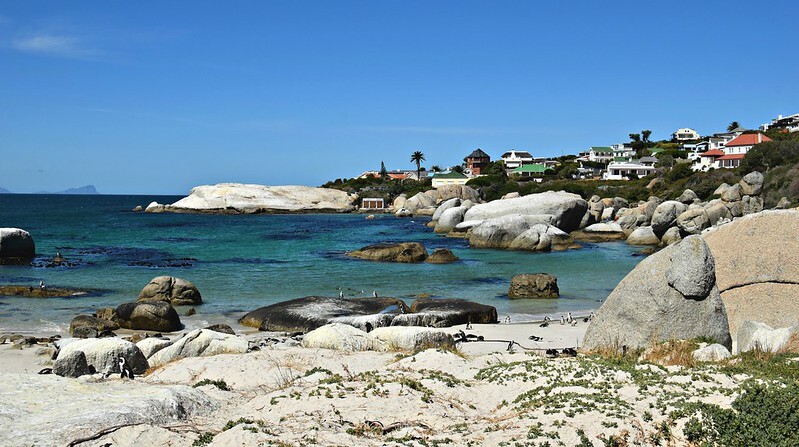 Now Boulders Beach on its own is absolutely stunning, and aptly named for the many granite boulders that are scattered along the beach. 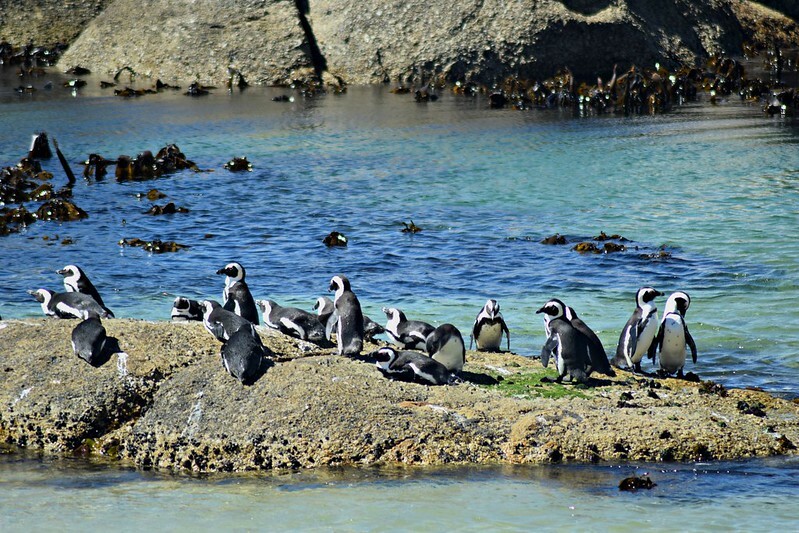 What makes it even better, is that its home to a colony of adorable African Penguins. 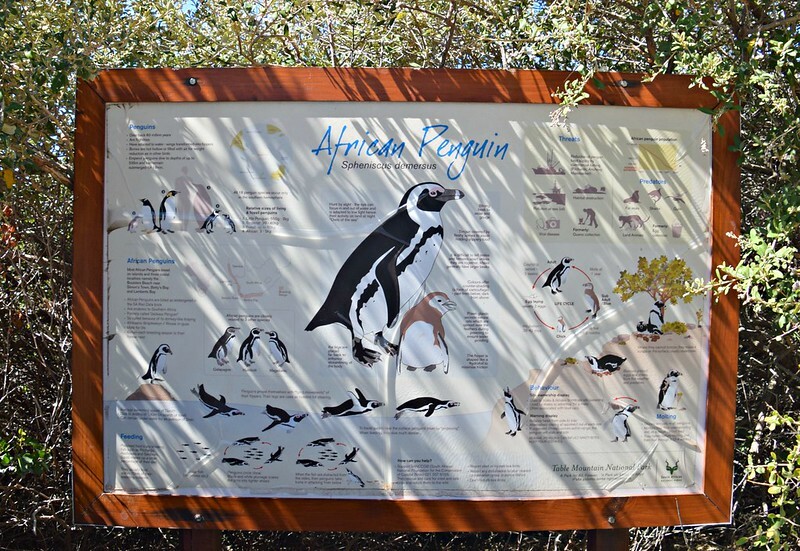 😀 The facility was also nice enough to provide educational information about this species of penguin, so I’d thought I’d share a few facts with you. 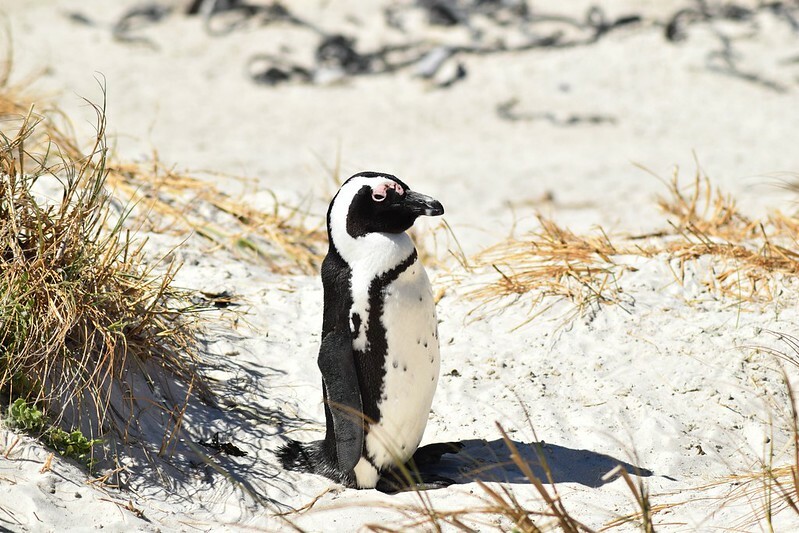 🙂 First off, you might usually associate penguins with cool, arctic conditions; however, these African Penguins have acclimated to much warmer temps. 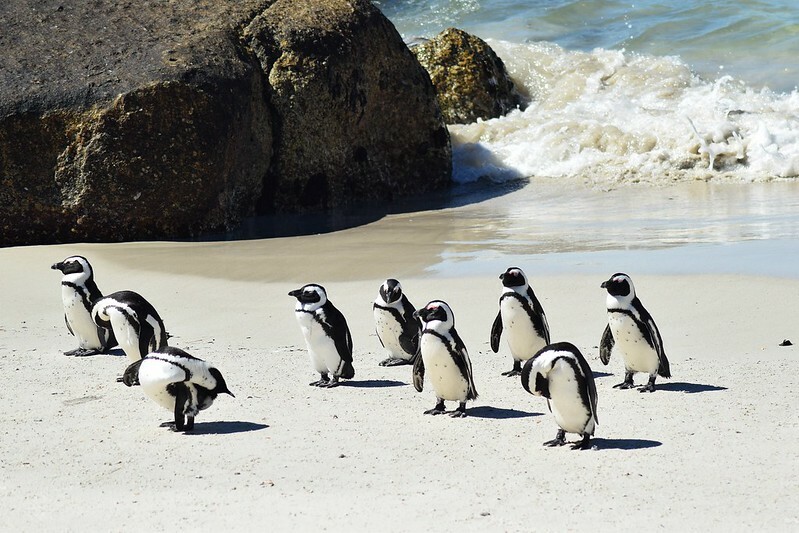 These penguins live off the coast of Namibia and South Africa. 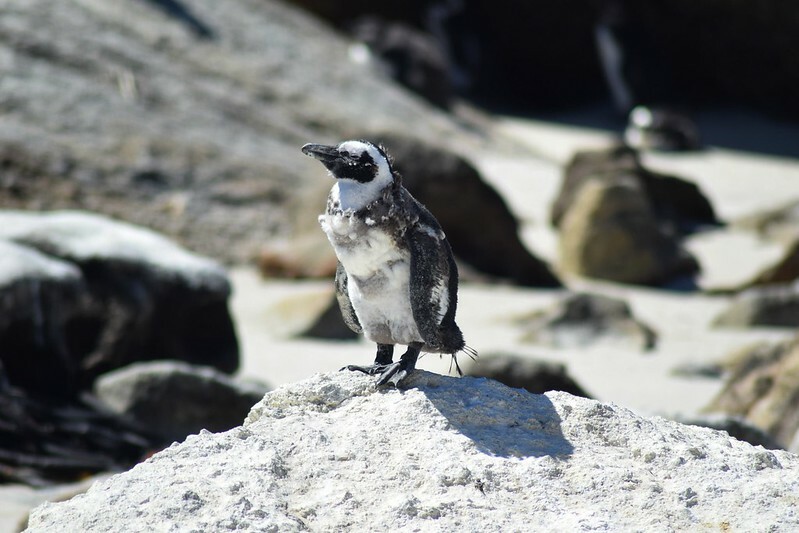 Their diet consists primarily of anchovies and sardines, and they can hold there breath for over 2 minutes while the dive in the water to catch these small fish. 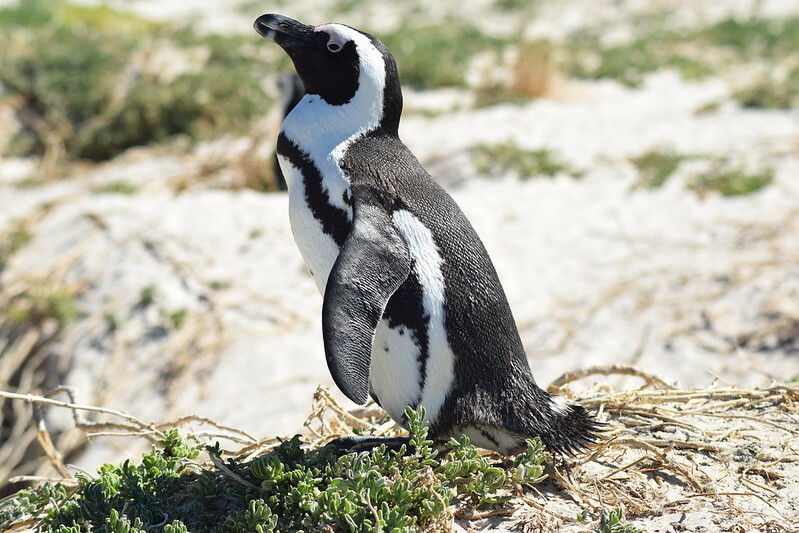 These flightless aquatic birds have short tails and flipper-like wings, which help them to navigate underwater. 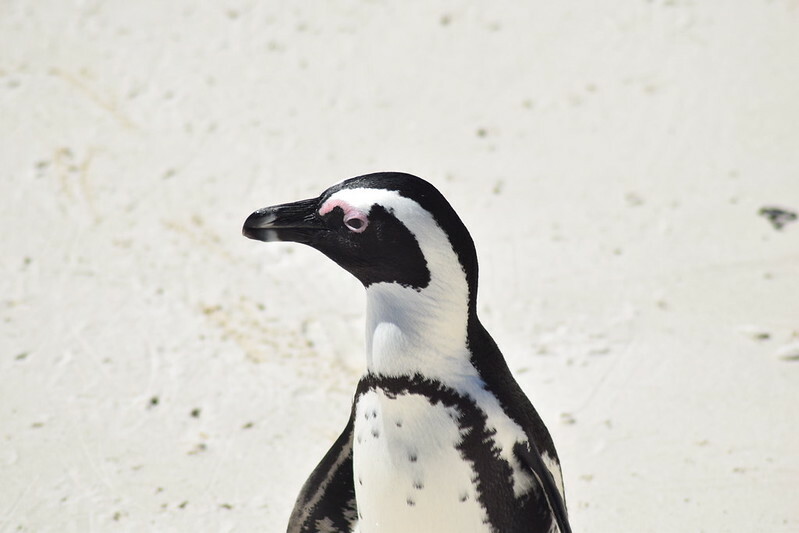 They are also covered in dense, waterproof feathers to keep them dry and insulated. 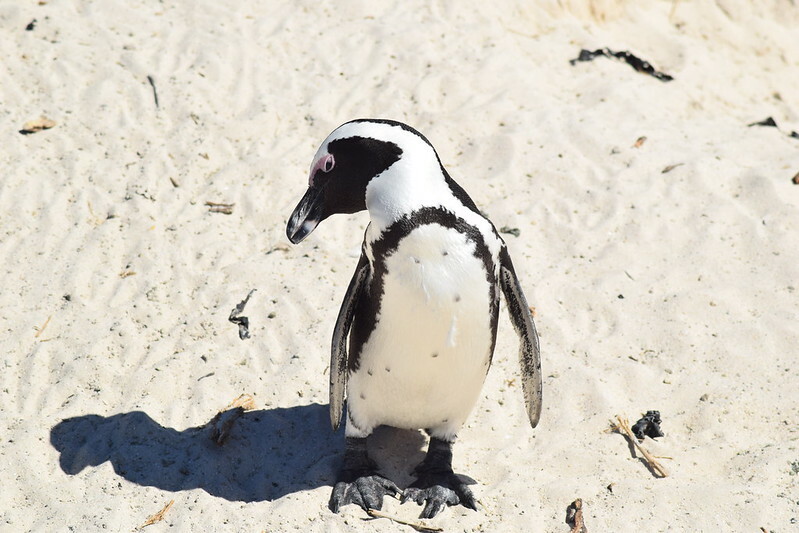 On a more humorous note, African Penguins are also called Jackass Penguins, since they make a donkey-like noise to communicate. 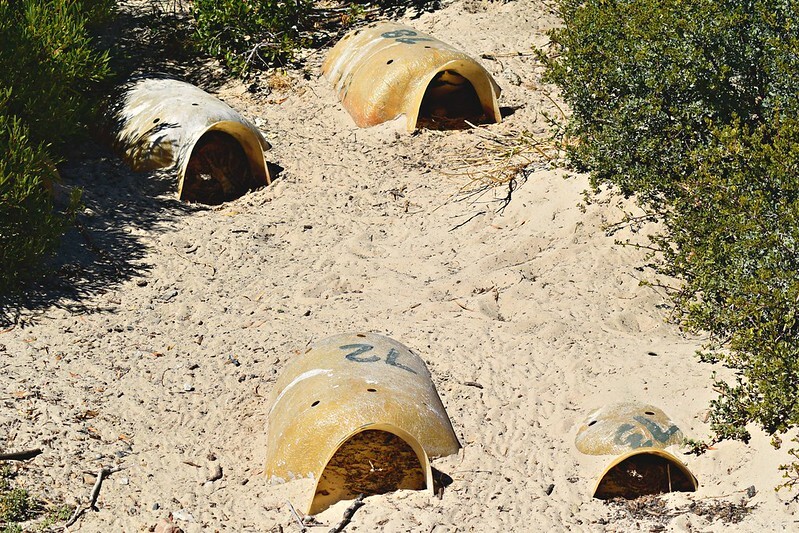 What I found most interesting was how their colors are used as excellent camouflage. As they swim, the white on their bellies blends in with the light, which makes them difficult to spot for predators looking at them from below, and the black on their backs blends in with the darker seas, which makes them difficult to spot for predators looking at them from above. 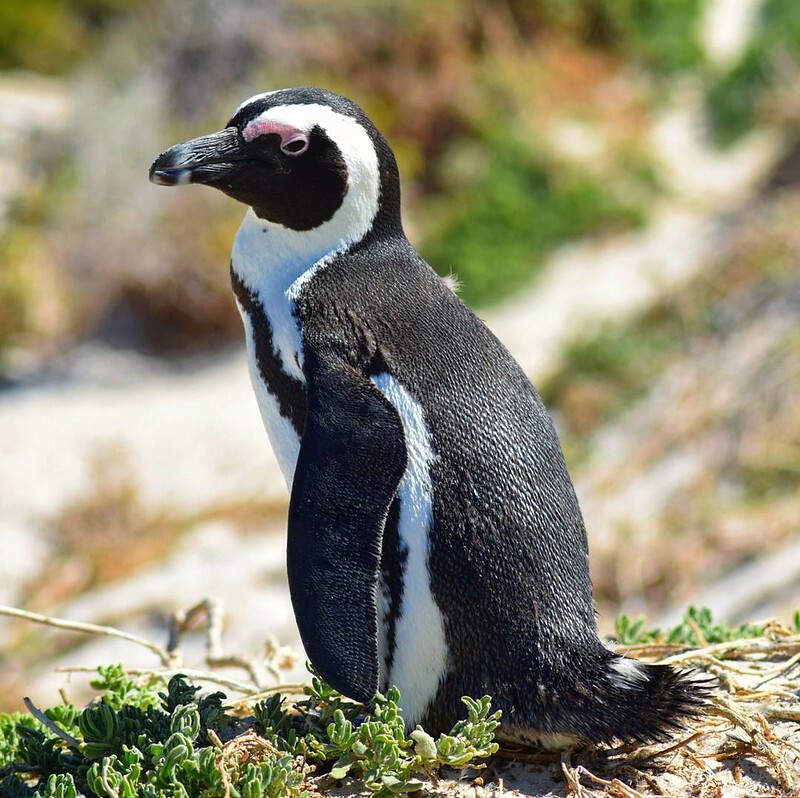 Despite this survival tactic, the population of African Penguins has still declined an estimated 95% since the turn of the century, mostly due to commercial fishing and climate change, and they have currently been added to the endangered species list. 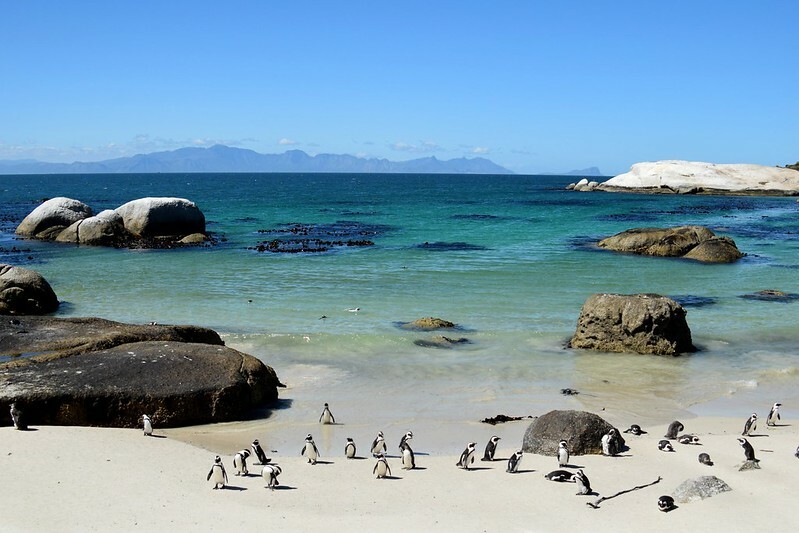 This is why Boulders Beach is park of the national marine park area, which protects this colony and educates visitors about their importance. 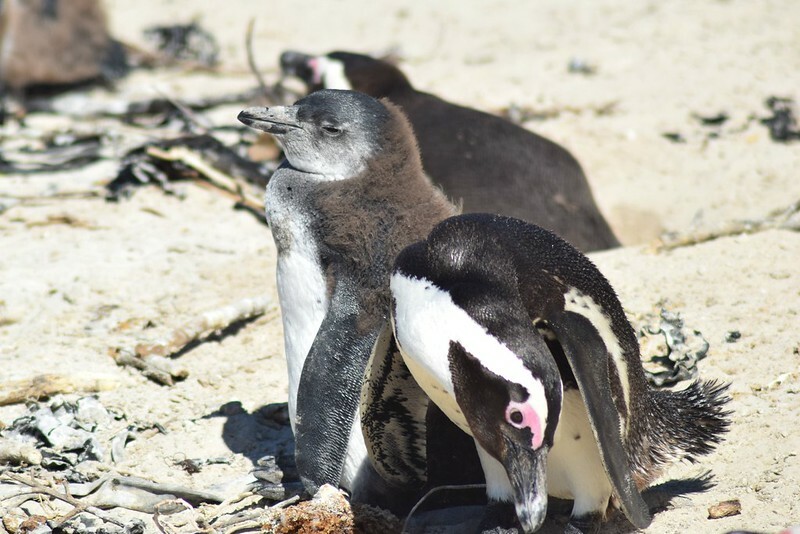 Visiting in the beginning of the year was also great, as I got the chance to see baby penguins that had just been born that January. 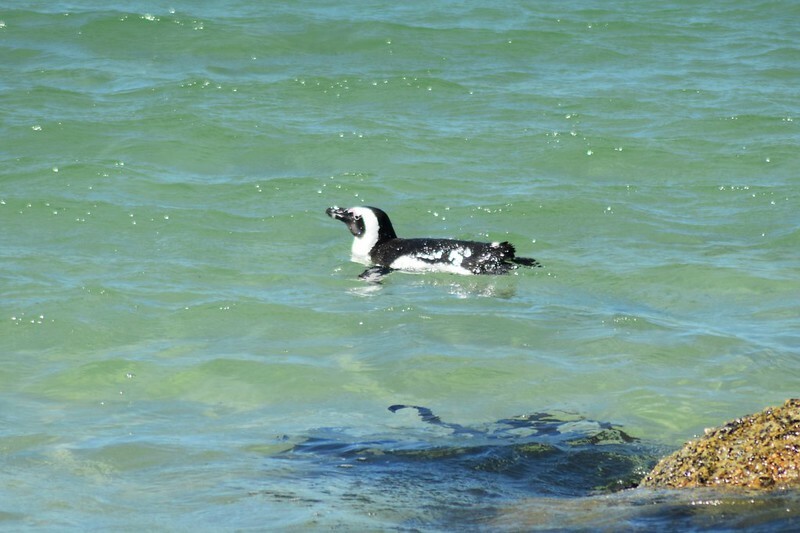 I even saw the penguins moulting, a process that occurs when chicks turn into juveniles, and also annually for adults. 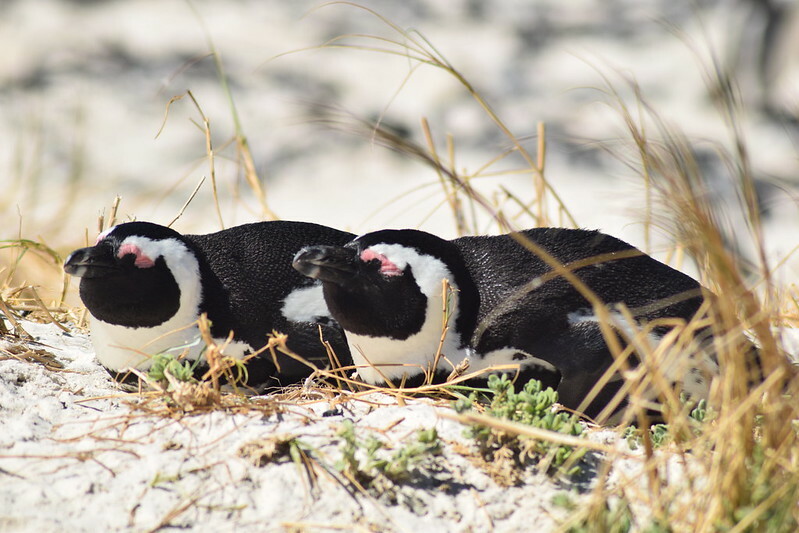 In this period of 3 weeks the penguins shed their old feathers to make room for new growth. 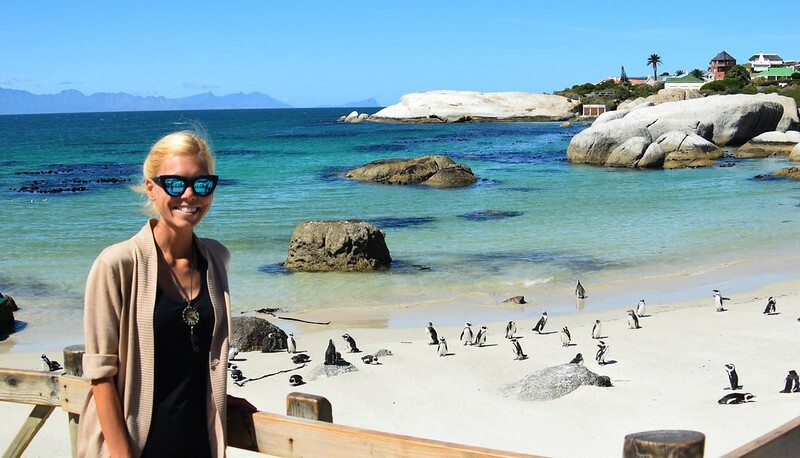 Overall, I recommend Boulders Beach for anyone interested in local wildlife or an educational outing in a beautiful natural setting. 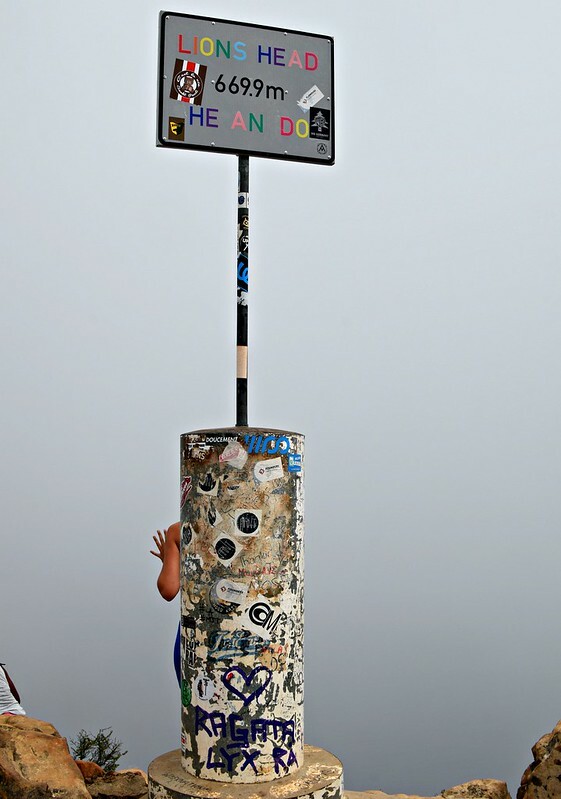 It looks like a lovely, invigorating hike, especially when you get to the top and and have view. 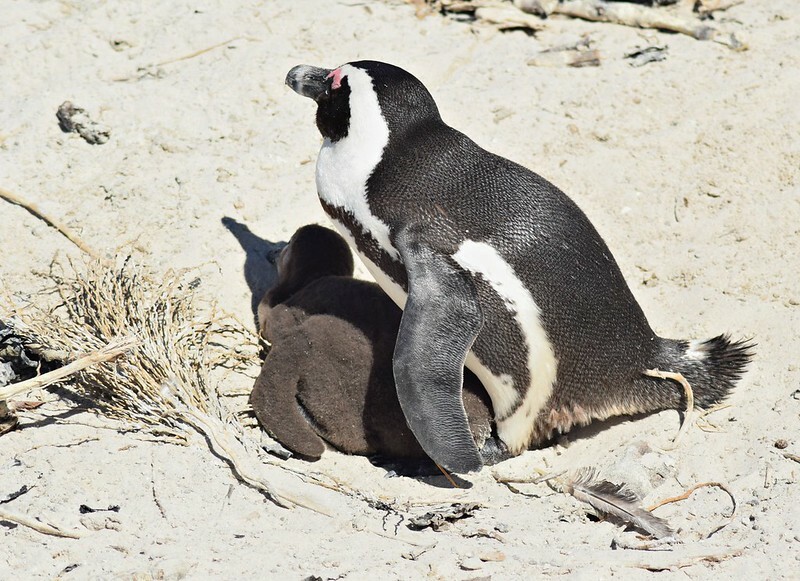 The penguins are so cute too. I think I saw a bird moulting the other day – it was all scraggly. 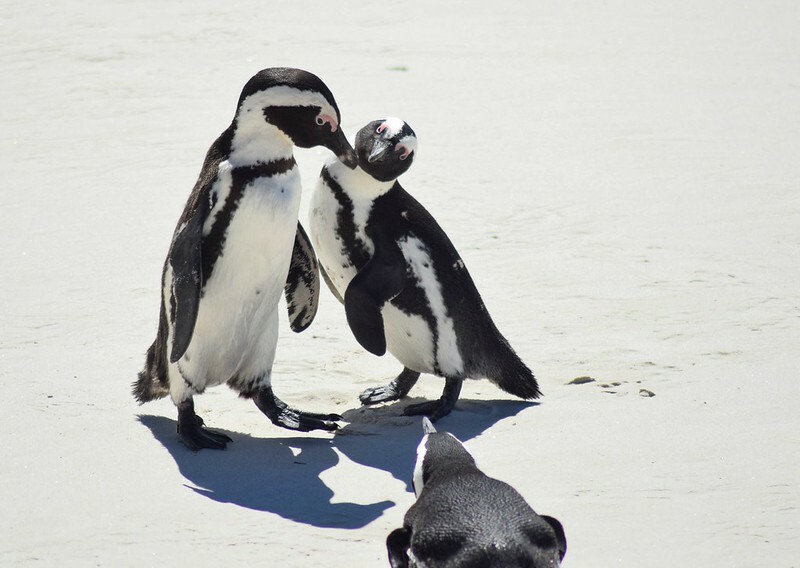 We love penguins! Hope to be able to get there soon! This looks like great fun. 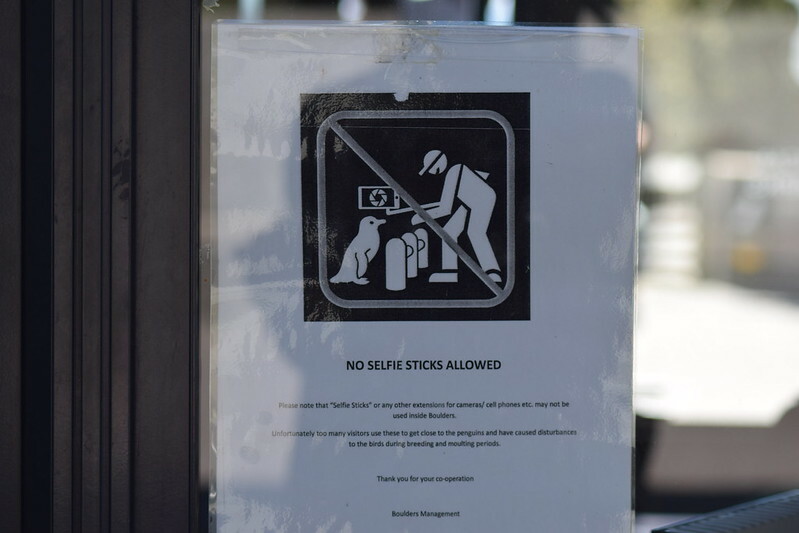 Love the penguin photos!